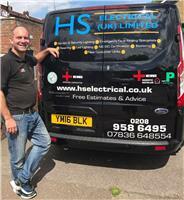 H S Electrical UK LTD - Electrician based in Stanmore, Middlesex. Whether you are looking for an NICEIC Electrician or electricians in North West London, Stanmore, Edgware, Harrow, Mill Hill, East Finchley, Golders Green, Hendon, Hampstead, Bushey, Maida Vale, Highgate, Barnet, Borehamwood, Elstree or Radlett and all surrounding areas we provide electrical inspection and testing services and are 24 hour emergency electricians, contact HS Electrical today. HS Electrical are a small family run firm of electricians based in North West London. We have been established since 1987 and we cover all areas in and around North London. 24 hours a day, 7 days a week, we are available for emergency call outs., HS Electrical are here for you. HS electrical is run by Harvey Solomons who served a 5-year apprentice and has a wealth of experience going back over 31 years. We are NIC EIC approved contractors and all our electricians are City and Guilds qualified Qualifications are updated on a regular basis so we can offer up to date advice on all our installations. We are Part P approved and are specialists in landlord inspections and testing, offering landlord testing in Edgware, landlord testing in Bushey, as well as all other nearby areas. HS Electrical pride ourselves on being an extremely reliable and professional firm and offers free estimates and advice at all times. No job is too small and all our work is fully guaranteed and backed by NIC EIC certification. We look forward to receiving your call.